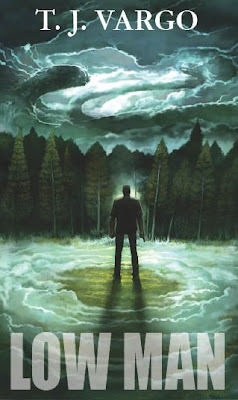 "Low Man" is a horror novel written by T.J. Vargo and published by newly born publishing house, Leucrota Press. Benny Assissi is a man who believes his life has taken a descending slope. He lost his previous job because the factory closed its gates and now he is working as a convenience store clerk, his wife is unhappy and his son got seek. To keep the things worse this evening somevody tries to rob the store on his shift and because of this event he learns that he has to fight not only for his life, but for his son's life too. With all the respect and consideration for the work made by T.J. Vargo on "Low Man" I didn't find his novel fitting for the horror genre. Throughout the novel's length the grotesque images are scarce, terrifying scenes are almost inexistent and the horror is rather a personal turmoil of the main character. Unfortunately nothing managed to terrify me while reading this novel. It is true that the novel has some images and scenes which are proper for a horror novel, but they lack power and intensity. And sometimes the novel seems to me like a personal interpretation of the author of Dante's "Divine Comedy". Also the pace of the novel is slow, sometimes painfully slow. The author keeps a steady rhythm, but unfortunately this rhythm is slow and in some scenes it decreases even more. The characters are rather shallow, without a proper development. Benny Assissi, the main character, has a great struggle in his life, but I failed to be sympathetic with him. I saw some glimpses of his background, but without this aspect being consistent. Other characters seem inconsistent as well, with different issues that I found unattractive. For example, Sam Freeman, another important character, seems to eagerly drawn to a more moral side of his. I find hard to believe that a man like him, who does anything for money and leaves somebody shot to death behind, to change all of the sudden in a moral and compassionate person. Mario Berardi on the other hand looks like being developed only for a minor event in the end, an event that seems unimportant, with any significance. My general impression is that T.J. Vargo is trying to give to every event in his novel a moral conclusion and he is trying to pass a correct judgment on every character. Although I totally agree with this reason I don't think that it works properly on a horror novel. However if the general idea and some aspects of "Low Man" didn't worked for me, the author does show talent in his novel, but a little rough and unpolished. For instance I didn't have a problem in reading his novel, I read it pretty fast although I didn't enjoy it that much. And although some emotional scenes were fitted for a drama, they were pretty well done. T.J. Vargo might prove successful in the future, but unfortunately for now his novel "Low Man" didn't had success with me. Maybe you are interested in an additional review of "Low Man". Dark Wolf, I know you understand that I doesn't want to offend you. It's just like: Different people different opinions. But I will sustain further on my review and my impression of the book. Sorry, I forgot the subject in my previous comment.